Fringe Reporter: Chemtrails or contrails? An excellent example of an evolving conspiracy theory is the debate over Chemtrails. If you start watching the sky carefully, you will notice that sometimes there are trails left behind planes such as in the picture above. Under certain conditions contrails form behind jet aircraft. These conditions usually involve planes flying at very high altitudes (above 8km) and very cold temperatures (less than -40 degrees Celsius), but contrails can form in certain other conditions. Chemtrail theorists suspect that these clouds are evidence of an intentional spraying program. One common idea is that chemtrails are a secret program to combat global warming by spraying reflective particles into the atmosphere. Anyone who watches the sky on days when these clouds are sticking will notice that as time progresses the clouds tend to disperse and eventually "grey-out" large areas of sky. Even if these clouds are just "harmless" aircraft contrails, the fact that they can completely block out the sky seems like a major environmental hazard. This likely helps to explain why chemtrails are such a popular conspiracy topic. There are numerous time lapse sequences available on the Internet that demonstrate the thick cloud banks being formed from the jet contrails/chemtrails. Air pollution from jets is a terrible thing, but pollution does not really qualify as a conspiracy. There are many Fringe ideas about chemtrails worth exploring. Before we head into the outer realms, here is another video from Channel 4, KNBC, in Los Angeles. This video raises the question of chemtrails, and then shows several interviews with scientists advocating future spraying of reflective chemicals to combat global warming. Given the mainstream media origin of this piece, disinfo must of course be suspected! Of the three main chemtrail theories, we have already covered the idea of covertly fighting global warming to avoid admitting to the populace that there is a problem. The rationale for secrecy is to avoid market panics or political repercussions while minimizing embarrassment of officials who until very recently have denied the scientific research about global warming. While a secret project to fight global warming that involves spraying chemicals in the air without public consent sounds pretty bad, there are far more Fringe-worthy theories out there. Some on the Fringe think that these sprayings are either poisonous or toxic agents meant to stress the bodies of those who are already sickened or weak. Instead of being directly deadly, some think the chemtrails are the first step in a two part scheme to cull the human population. The basic idea is that the chemicals sprayed will somehow weaken the population and make them extra susceptible to the second agent, likely an infectious biological agent. Of course the powers that be (PTB) will have an antidote available for themselves and necessary workers. These ideas usually involve a suspected NWO or Illuminati plot. Have you been feeling ill, fatigued, or run down lately? The idea that the sky is raining toxicity down upon unsuspecting millions is an intimidating prospect. 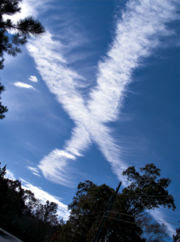 The meme of chemtrails invites a large following because people can observe these clouds for themselves. Since there is something going on, it is easy to project fears onto this phenomenon. If regular airplane traffic is able to blot out the sky, shouldn't there be more regulation regarding flight patterns or at least some official discussion of the environmental issues? The dismissive response to this point by government and military officials makes it easier to imagine vast conspiracies behind the observations. Have you noticed the chemtrails? What do you think? I first came across information about chemtrails about a year ago. Having observed them myself now and marveled at how I never noticed them before, it does not seem a stretch to say that something is being released from non-commercial aircraft. 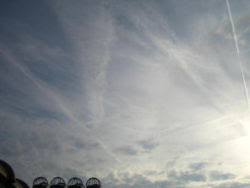 Although the Illuminati type conspiracy idea, replete with secret plots to kill off most of us, is entertaining, it seems far more likely that the chemtrails have something to do with global weather patterns (as you mentioned) and/or inducing mild illness or even chronic illness in the general population in order to pump sells of pharmaceuticals. I grew up about 40 miles from an Airbase and the trails that I now see in the sky really do not seem the same as contrails which typically fade within minutes. Who knows what is really going on! Many proponents of Chemtrails also describe noticing a difference between the contrails of past times and the current long lasting chemtrails... Thanks for the observations!